Multiplex was a webcomic following a group of cinema employees that ran from July 2005 to April 2017. The strip's creator Gordon McAlpin had originally envisioned the concept as an animation but lacked the ability and resources to make it happen at the time. Now that that comic has come to an end, he hopes to finally bring the characters to life in animation- and is turning to Kickstarter to make it a reality. 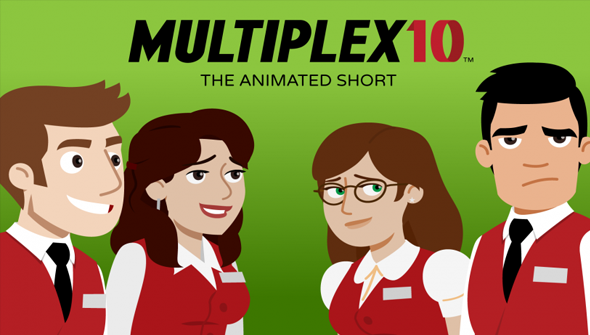 Multiplex 10 is a proposed 11 minute short, that is also intended to act as a potential pilot for further episodes. Described as "part reboot and part prequel" it's intended to be equally accessible to fans of the comic and newcomers alike. The short (and the comic) follows cinema employees and friends Melissa, Becky, Kurt and grumpy film snob Jason. The producers say "Multiplex 10 will appeal to movie lovers, anyone who's ever worked a retail job, and anyone who's had an annoying friend who just can't shut up about why the things you like are terrible. " McAlpin is teaming up with producer Dana Luery Shaw as well as fellow web-comic artists (and former collaborators on podcast The Triple Feature) Tom Brazelton (Theatre Hopper) and Joe Dunn (Joe Loves Crappy Movies), The writers/producers will also be voice-actors on the project. The project is seeking $15,000 by May 8, 2017. A pledge of just $5 will get you early access to the finished project of $10 will bag an HD download. Higher reward tiers include a digital artbook, original artwork and producer credits. If this sounds like a project you'd like to help out, head over to the campaign page for full information or to pledge your support.